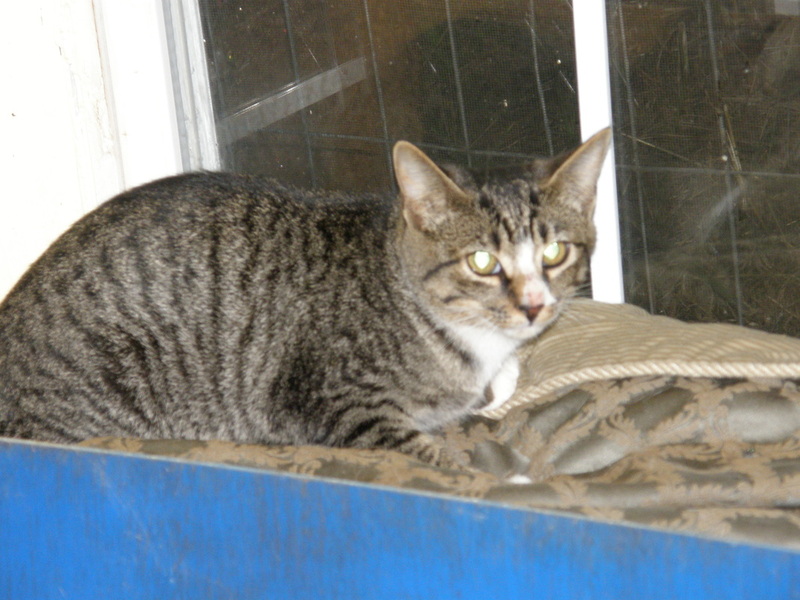 CRR got a email from a concerned citizen stating there were several dumped cats at the East Buffalo dumpsters again. 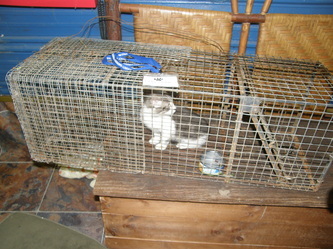 We trapped them and have had them vetted and are currently working to socialize them. This is a growing problem in our community. 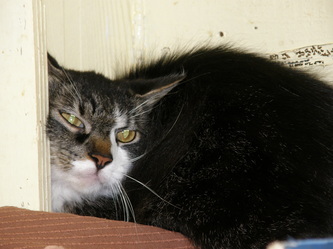 When pet owners do not spay or neuter their pets they multiply fairly quickly and with no available homes and the humane society not taking in Graham County animals, they opt to dump them at local dumpsters to rid themselves of the problem. 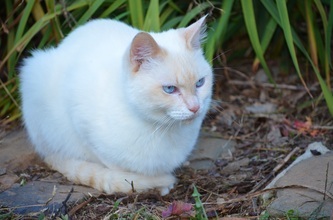 This just causes more problems as these cats then become feral and multiply where ever they are dumped. They have no source of food except what they scrounge from the trash or sometimes if they are lucky some caring person will leave them some cat food. They get sick and with no veterinary care usually die slow painful deaths. They are left to fend for themselves. They face many dangers some of which are attacks from wild animals, dog attacks, run over by traffic, or people who poison, shoot, or maim them. People don't like them getting into their trash. Its just a nuisance to them but the poor animal is just trying to survive. Imagine if someone just dumped you out with no source of food, water or shelter. What would you do to survive? You cannot fault the animal. These poor animals suffer due to irresponsible pet ownership. 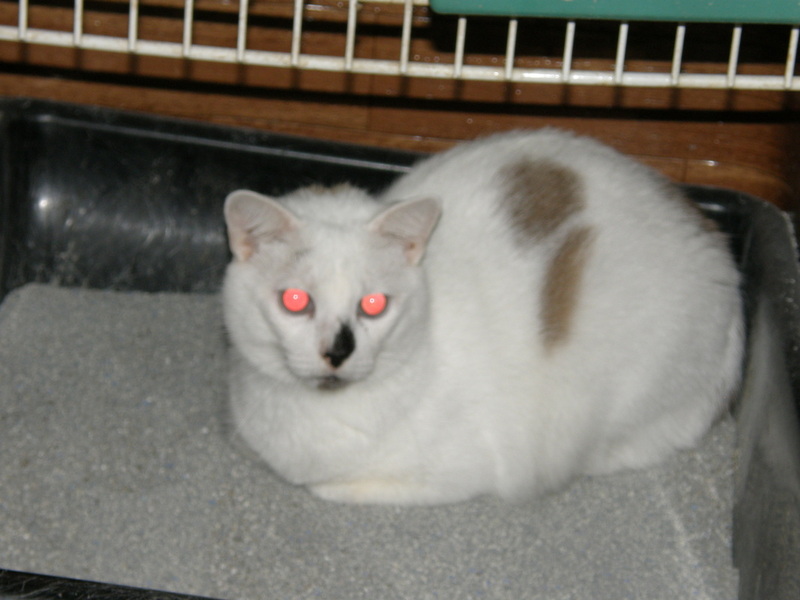 I cannot count the phone calls we get from people who started out with one or two cats and then let them multiply to thirty and then ask us to come and trap them and take care of the problem they have created. There are several reasons pet owners do not get their pets altered. One reason is finances. Some cannot afford the expense even with a low cost spay and neuter. Males are often not neutered because they don't bring in the kittens but with unaltered males running loose many more cats get bred and so the problem continues. 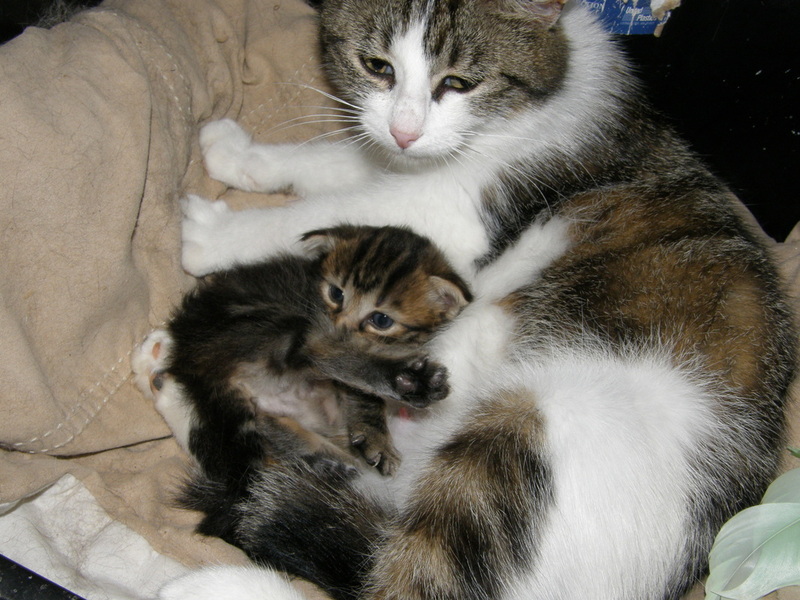 Some think they need to let their cat have at least one litter or that they want their child to experience the joy of a litter of kittens. I have even heard the excuse of not altering because then they will not be a good mouser. None of these are good reasons to not spay or neuter your pet. 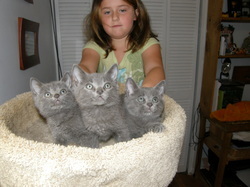 The kittens will need homes. What if you can't find homes for them all? 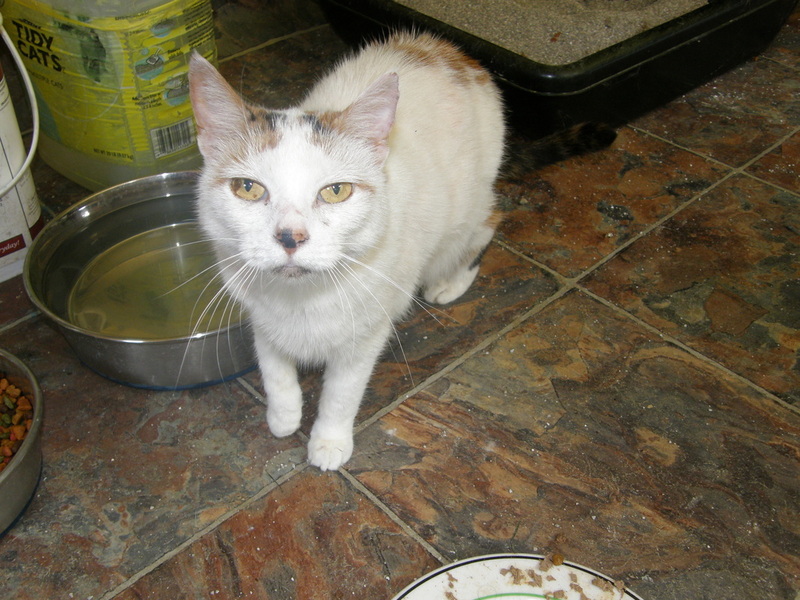 If you do find a home will that person spay or neuter it? Some just take what they don't want to the humane society. As an owner turn in the shelter can euthanize that animal as soon as it is taken in. If you say its a stray they only have 72 hrs to find a new home. 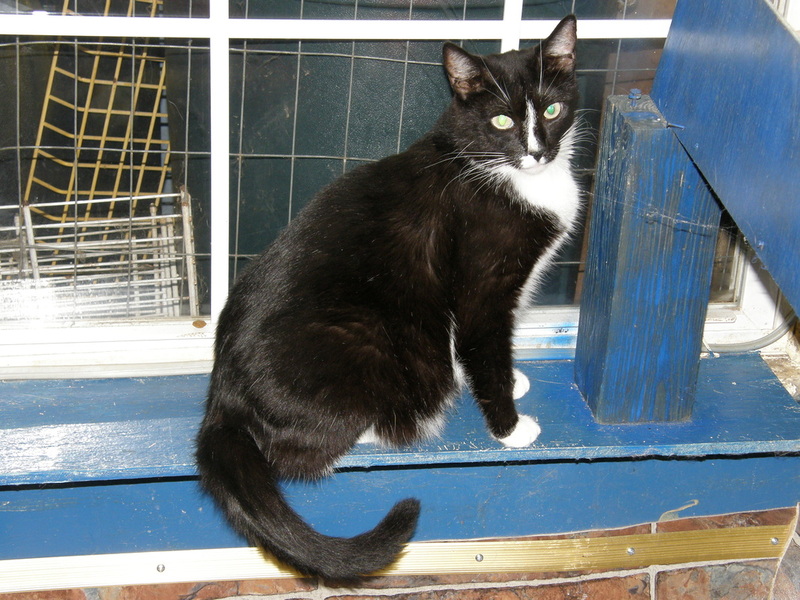 Only a very small percentage of cats get adopted from shelters. 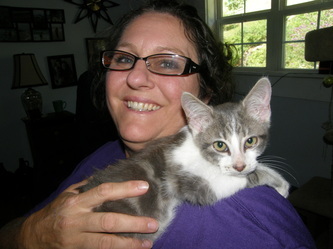 Mostly kittens is all that get adopted and adults are few and far between. Some shelters have over a 90% kill rate so basically you are just killing that animal by taking it to a shelter. 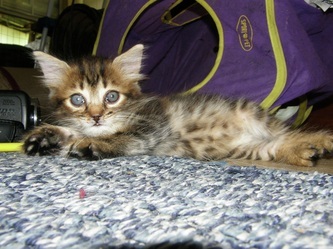 Is it more humane to have kittens/puppies just to be killed or to spay your animal? And what is up with thinking your male dog/cat is more macho by leaving it unaltered? That is the silliest thing I have ever heard. According to the Humane Society of the United States over 4 million pets will be euthanized each year! That's 4 MILLION! When will people wake up? I see posts all day long for thousands of poor animals stuck in shelters waiting to be gassed or heart sticked just because no one will give them a home. 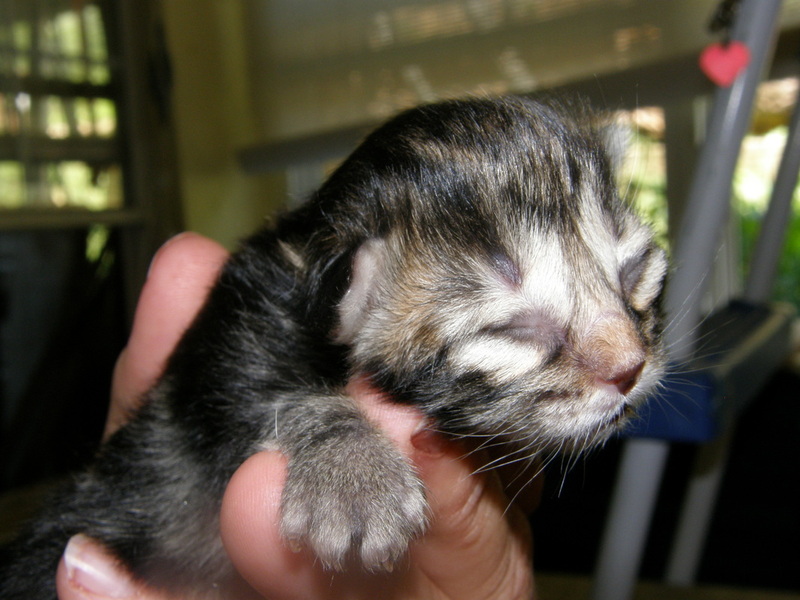 Some shelters during kitten season were euthanizing every day just to make room for more. I see people going to breeders and buying animals but won't give a adoption fee to save the life of a shelter animal. I see animals abused and tortured in ways unimaginable. People giving away free kittens don't realize there are people who hunt for free to good home, pose as families even and then sell the animals to animal testing facilities. This is why I am so adamant about getting your pets spayed! There is more to caring for a cat than just giving it a bowl of food each day. It takes money to care for a pet on a daily basis. If you cannot afford to care for a pet properly the most humane thing you can do is not take in a free kitten but find it a home that will be able to care for it. Sure they are cute and your child will love it, but are you going to be able to keep that animal healthy by taking it to the vet for the proper care? It costs us over $200 per cat to get its shots and spay/neuter and that doesn't include the daily food/litter and other expenses that come up. 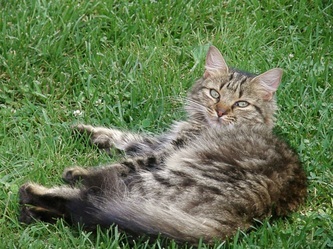 The average cost for annual care for a cat according to the ASPCA is a little over $1000 a year. This is something that you need to consider before taking in that cute little kitten. Some people have tried to help by taking in that poor dumped out animal that shows up on their doorstep. They feed it but cannot get it spayed/neutered and then the problem mulitplies very quickly until they are overwhelmed by their good deed and unfortunately have nowhere to turn. There needs to be a solution. We are currently trying to help get the word out about the SNIP program at Andrews Veterinary Clinic. ITs a low coast spay and neuter program for low income families. Logans Run in Murphy also has a similar program. We are trying to work with Andrews Veterinary Hospital and come up with a grant or some type of funding to help supplement the SNIP program to make it free of cost to qualifying individuals. We hope we can get this done in the near future and will keep you posted. 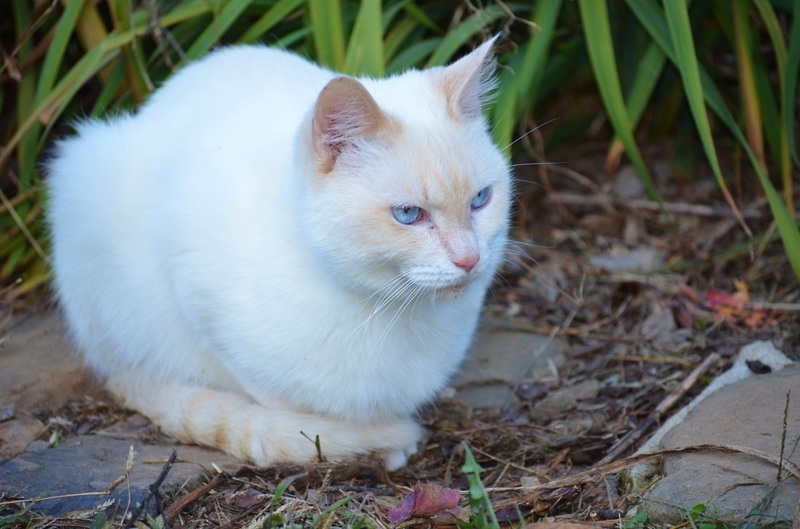 We have a problem of ferals in our town. Lots of people are complaining and wanting a solution. Some think shooting them is the only way. Our local newspaper even suggested that as a solution! Why should innocent animals suffer due to irresponsible people?! He said he had fed 2 ferals himself like this shows he's trying to fix the problem but this does not help unless you get them trapped and altered. Its bad enough we have people poisoning them and mutilating them. We took in three kittens this summer with chopped off tails! And in the last year we tried to save two after being hit by a car and then left to die slowly. One poor cat was seen staggering all over town for an entire day when it ran across the road in front of us at the stop sign, obviously in tremendous pain. I jumped out and grabbed the poor thing and rushed it to our home. It was after hours by then and no vet was available. 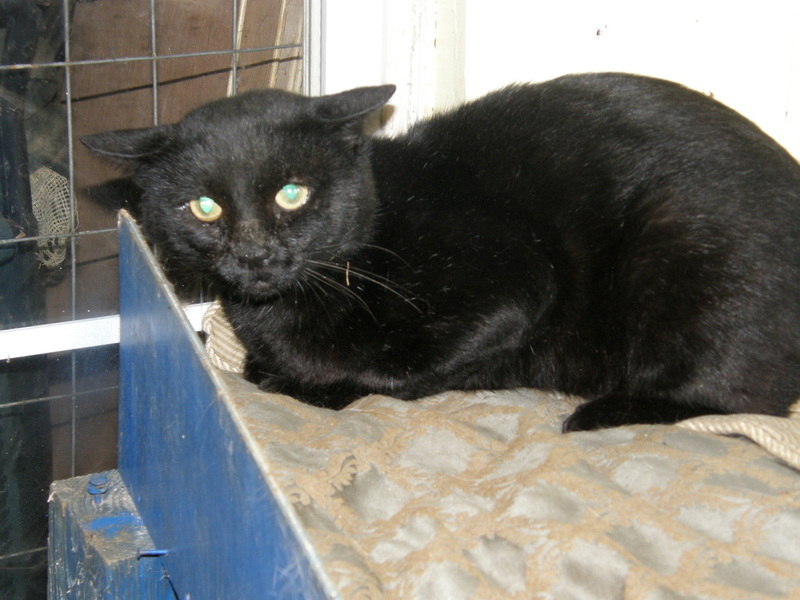 He died a short time later but who knows if he could have been saved if someone had taken the time to get him to the vet. How could anyone leave it like that all day and do nothing to help it even if it was to euthanize him and put him out of his misery. Where is our compassion as a society? 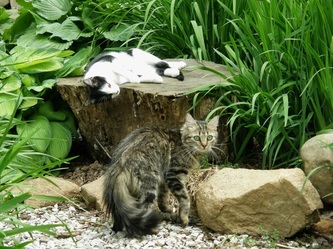 We do not have a TNR program in our community. 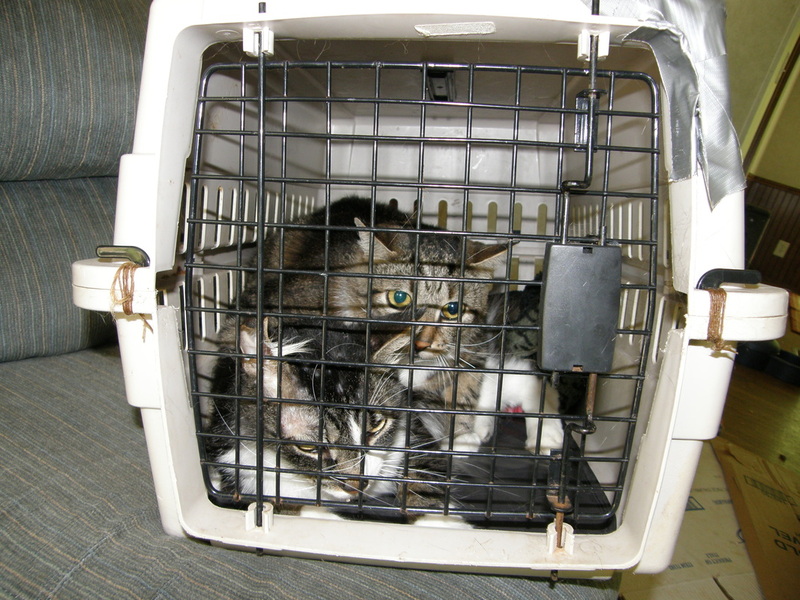 (Trap Neuter Return) and I don't believe returning those in town would be a good option. I believe they should be relocated due to the hostility towards them. 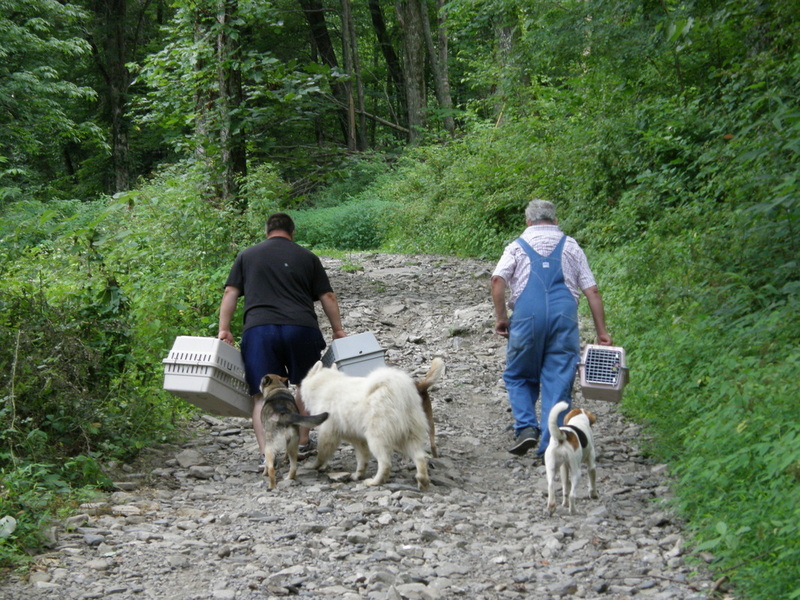 This is where local farmers would need to be contacted to see if they would consider taking in ferals to help with rodent control and in return agree to provide food and shelter for these animals. 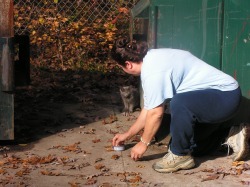 TNR is not a quick, easy solution. It takes a lot of volunteers to run this program. It takes a lot of time and it takes a lot of money but can be done if caring citizens help. I would also like to address another topic. 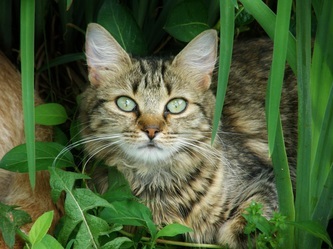 People have a misconception that ferals are vicious and should be euthanized. This is untrue. These cats are just trying to survive. 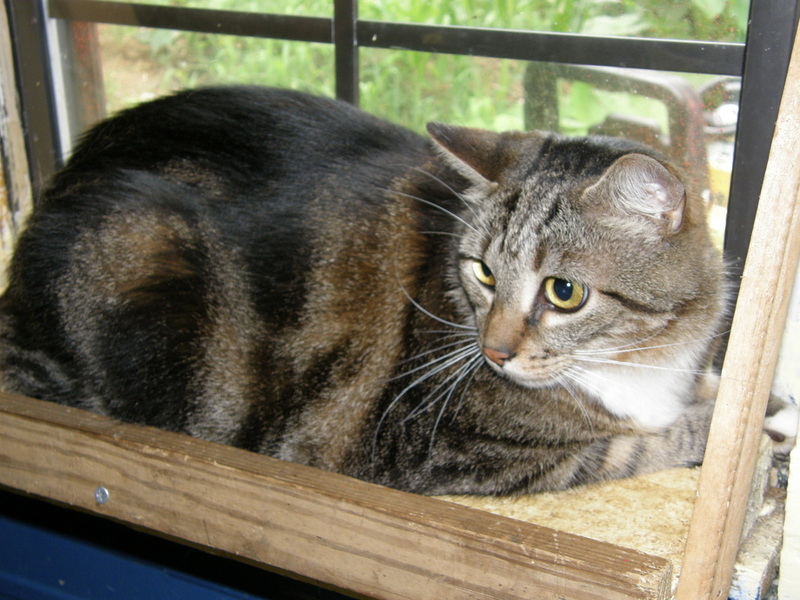 While its true some will never be tamed or lap cats, it is also true that some will.And those that won't make wonderful barn cats with proper care. 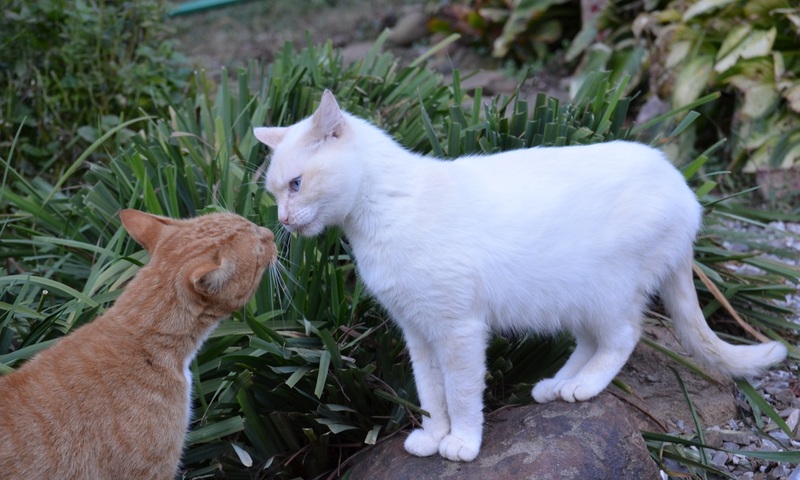 I have worked with lots of ferals and while the younger you can get a feral the better I have several older cats that are very friendly now. Sully is a lap cat now but it took me 4 years. It just takes time, love and understanding. Any cat in a trap will act feral. They are just scared and its a shame that they get put to sleep for just trying to survive. There are better solutions and shooting them is not an option for a caring society. Almost all of these new ones we trapped are fairly friendly now. Little Molly sleeps with me and my granddaughter as well as Jilly Boo. Its very rewarding to work with ferals. We need more education on this problem. I pray one day we will be a no kill nation. 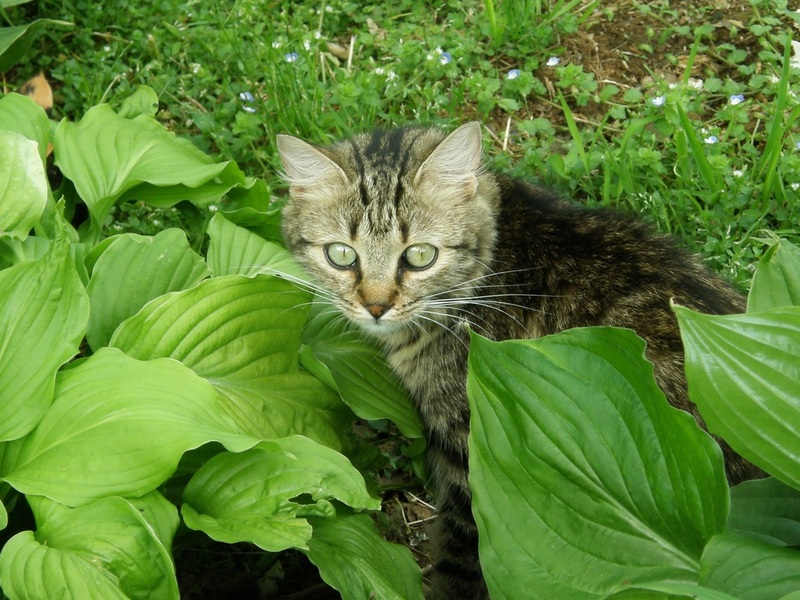 Here is a wonderful link for our county to look into to work towards fixing the feral cat problems in our county. Anyone interested in talking to the county and heading up this operation can learn a lot from this website. Just go to www.spayusa.org. I believe God places certain people in your life for a reason. Casey is one such person whom I had the pleasure to meet. Casey is a wonderful lady we met one day by chance (or was it?) She happened to see our sign after getting lost on her way home to Tennessee and stopped to see if she and her friends could look around. We showed her and her friends around our facility and they got to give the kitties treats. She loved our place and told us how she used to rescue kitties and find them homes. As she left I told her to make sure to add me on Facebook so we could chat. Later on that month, after we had become friends on Facebook I learned she had cancer and was having to sell all her possessions to move home with her mom in Texas so she could get treatment and the extra help she needed. The big problem was she also had to give up her three babies that she loved so dearly. She desperately wanted to keep them together and for them to have a loving home. We decided to grant her wish. We immediately told her we would take them for her so they would stay together and we could email her pictures and videos of them during her treatment and when she gets better she can reclaim her kitties. This is not something we usually do but in her case we thought it the only "right" thing to do. She brought her cats to our place today and they are settling into their new home. We wish Casey the best of luck with her treatment and are keeping her and her family in our prayers. 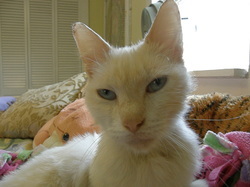 We are sending updates of her kitties progress and hope this brings a little relief to her at this time in her life. I look forward to the day she can return and take her babies back home with her! 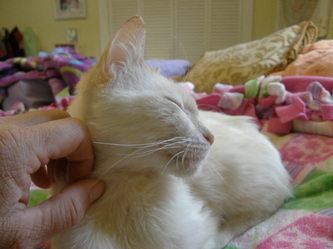 Until then they will be pampered Cat Ranch Kitties! Cruelty comes in all shapes and forms. This time it was the dumping out of a kitten at our local dumpsters leaving it with no source of food or water. 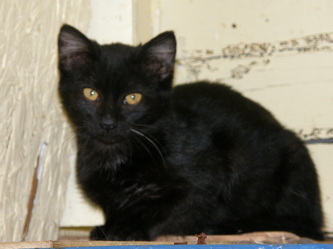 Luckily we got a call from a concerned citizen who said she saw a small kitten at Bear Creek dumpsters the other day and it looked like it was in great need of help. With just an hour or so before dark we jumped in the truck armed with a can of food and the cat carrier to see what we could do. When we arrived , at first we didn't see anything. 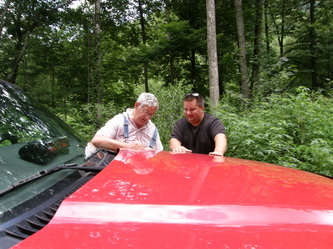 We searched the area with no luck and I continued to call just in case it was in the woods. These dumpsters are a long way from town and being in a remote area are a prime place for people to dump their unwanted pets. Just before giving up we heard a faint "meow" coming from up the embankment in the woods. I climbed the hill and tried to get close enough for it to smell the food but it was too scared. We kept trying till dark but then had to give up. 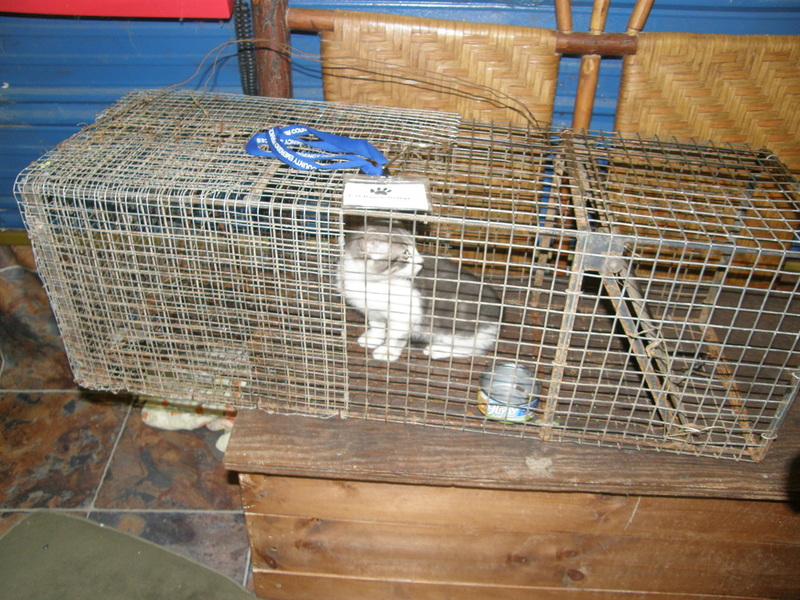 We rushed back to the house and got our humane trap and brought it back and by 10 pm had it set up for the night in hopes his hunger would drive him to the food in the trap. We returned at 6 am and the cage was empty but seemed the can was half empty. Hoping he would return for the rest of the food and actually trip the trap this time we left it there and decided to recheck after our vet appointment in Andrews. 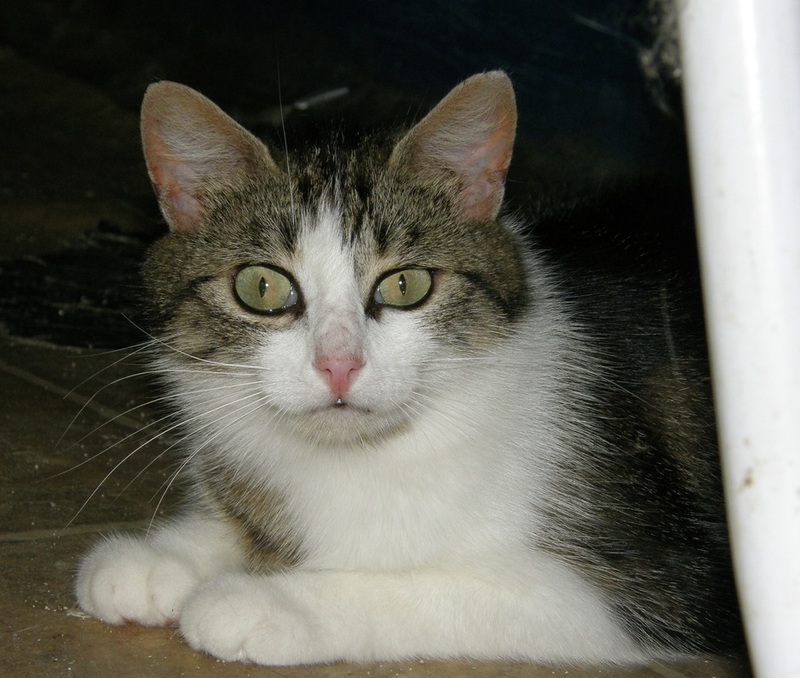 At 1:30pm we returned and as I was climbing the hill my heart sank as I saw the trap had been sprung but saw no kitten, just a empty food can turned over. I was so disappointed until I reached the cage and heard his pitiful meow. 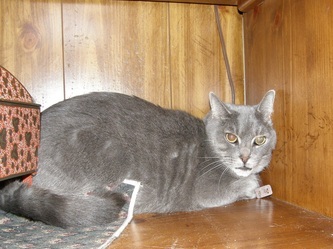 He was hunkered down behind the trap door. We were thrilled and rushed him home. I got him out and he was not so feral as we thought. He let us handle him and I even gave him a bath and got the fleas and grime off of him. He ate some more and then slept on my shoulder while I updated everyone on FB. He seems to be more content now and we are hoping with a little time he will calm down and not be so skittish with us.We pray he will be running around soon. Its good to get a happy ending to what could have been a very tragic situation. It saddens us when we see situations like this which happen over and over again in our community. Pet owners feel this is their only option when they can not find homes for the endless supply of babies. Adoptions are down making rescues full and unable to take in any more. On top of this we have lost our free spay and neuter clinic in Graham County. There is good news! At Andrews Veterinary Clinic in Andrews, NC you can fill out an applications for the SNIP program and get a reduced fee on spays and neuters. We hope to spread the word on this service to encourage more to get their pets vetted and help reduce the amount of unwanted animals in our county. Please contact Andrews Veterinary Clinic at 828-321-3316 for more information. When Mr.Farr showed up on our doorstep he was desperate. He was caring for 4 cats that were his daughter in laws who had lost her job and moved away. He had been feeding them for the last 2 months. The trailer had no electricity and it was too hot for them inside. He had tried everyone else and on one would help. We could not leave the cats in this situation. 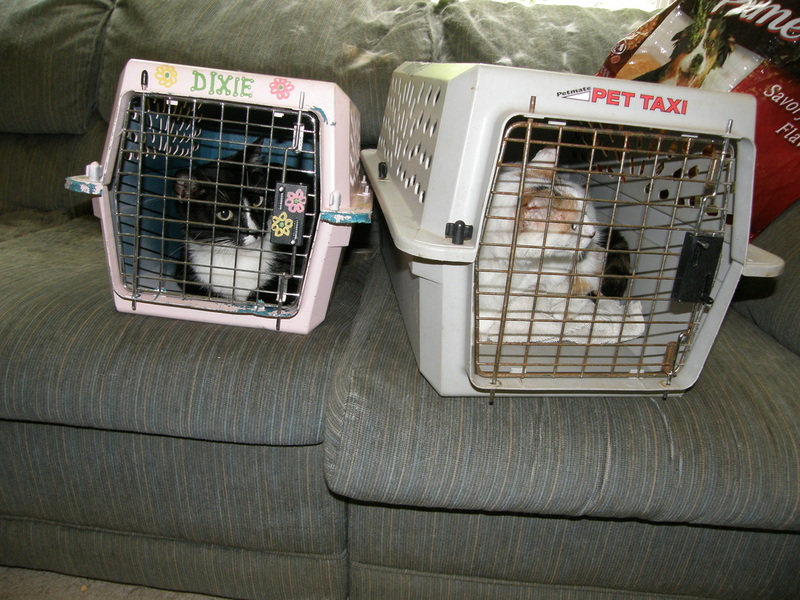 We loaded up our carriers and rushed out to get the cats. When we arriced we found the trailer in bad shape. 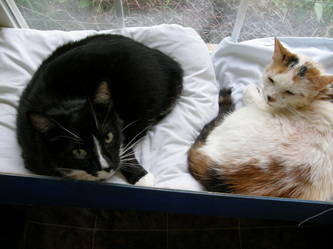 Even though there were over 6 litter boxes placed around the home the cats had gone on the floor everywhere. Ammonia was fairly high but the windows were open. We found 2 of the cats right away and placed them in carriers. We then went to search for the other 2 and when we found them they were so terrified from lack of human contact they ran into another room under a bed. We locked them in the room and finally hemmed them in the bathroom. The one we caught right way but the other tried to make a run for it and we got him as he squeezed under a door! 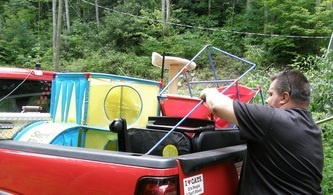 Mr. Farr donated the cat items to our rescue and even donated $40 more towards their care. He was very grateful for our help and we were glad we could help. 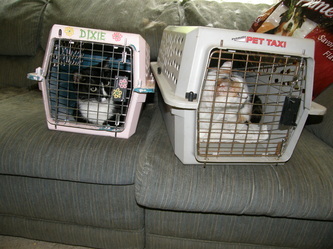 We got them home and in isolation with Nick, the cat we saved from being euthanized. They seem to be adjusting well and with daily work they will calm down and be more secure with their environment. They were very infested with fleas so we gave them each a dose of Revolution which will also worm them and get any ear mites is they have them. After contacting the vet they used we were very happy to hear they were all spayed and neutered and that their shots were relatively current. Follow us on Facebook for updates on their progress. Meet Stanley, a blue eyed, flame point siamese mix who has a story to tell. CRR got a call from the Stanley plant in Robbinsville to rescue a stray abandoned kitty staying under the guard station workers' truck for the last two days. He was believed to have been hit by a truck because of his staggering walk. We rushed to get him and evaluate his condition. We found him laying in the dirt, covered in fleas and extremely emaciated. He had a definite stagger to his gait so we rushed him home, bathed him with flea shampoo and gave him plenty to eat with a nice soft bed and being as he didn't seem to be in pain, we made him a vet appointment for the next day. In the morning we went straight to the vet where they did blood work which determined he was anemic and thankfully had a neg FIV/FeLV test. The good news was he was not hit by a car and was already neutered. The bad news was he was diagnosed to have cerebellar hypoplasia. 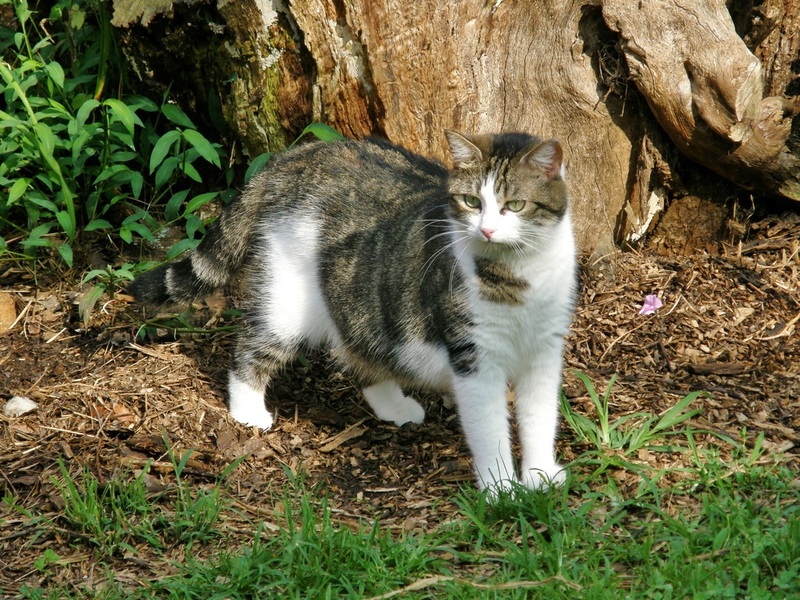 According to Wikipedia: There are several bacterial infections and viral infections such as feline panleukopenia, caused by feline parvovirus, that can result in the disorder in both cats and dogs. However, the disease can also be caused by malnutrition, poisoning, injury or general accidents during development in the fetus. 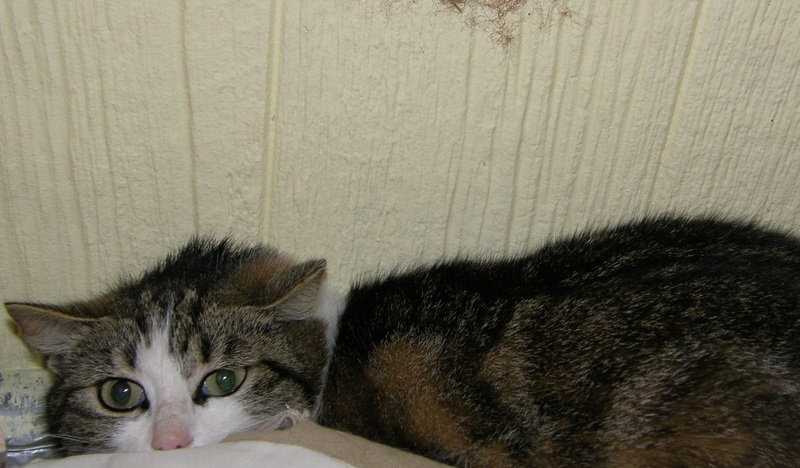 Cerebellar hypoplasia causes jerky movements, tremors and generally uncoordinated motion. The animal often falls down and has trouble walking. Tremors increase when the animal is excited and subside when at ease. 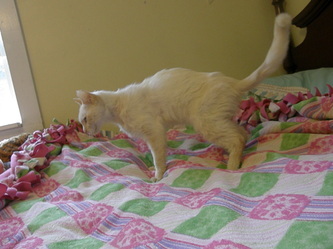 This diagnosis was not a bad one though because the good news is he can lead a long life with proper care. Stanley doesn't let anything slow him down. He's improving daily and loves to get attention. He's gaining weight and gets around fairly good and is even using the litter box. With love and medical care he should lead a normal life far from the nightmare life he was living. We named him Stanley, after the plant he was found at. Click HERE to see a video of Stanley. There are other amazing videos of other cats with this condition on youtube. 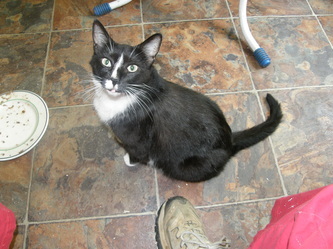 To sponsor stanley go to The Cat Ranch Cats tab. Meet Mozzy, Bonita Faye, and Gracie; the newest additions to the cat ranch's safe haven sanctuary. They have a story to tell. When Melinda drove through town a few days ago the last thing she expected to see was 3 small kittens, apparently dumped, wandering in the road. She immediately got out and took them in. She was horrified when she picked them up and realized they were victims of animal abuse. 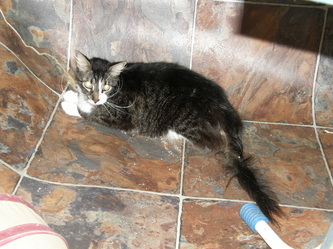 Someone had intentionally cut off the poor babies tails which were trying to heal but were still red and sore. 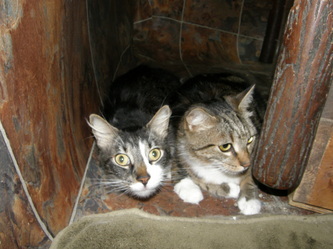 Even though they had been horribly abused, the kittens were still friendly and outgoing. Unable to keep them herself she called every available rescue she could to no avail so when she contacted us we felt we had no choice but to grant these babies the life they deserve. 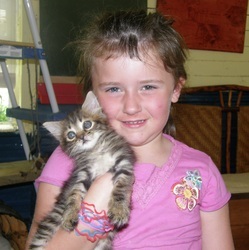 Here they are free from fear and will be able to grow up together in a safe environment. A big thank you from Anne Marie Walduck for sponsoring $300 of these babies vetting fees and numerous others who are donating to help get them the medical attention they need. Without you we would have been unable to take them in. We are amazed at all the wonderful caring people who are our Facebook family. Without them we could not do what we do. We depend totally on public support. 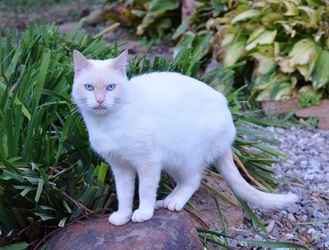 If you are interested in becoming a sponsor for one of these beautiful deserving babies or any of our other residents, please go to The Cat Ranch Cats tab. 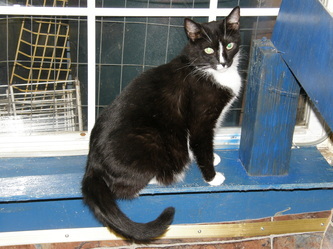 There you can look through all our cats and click on their pictures which takes you to that cats page and their story. to learn more about sponsoring please click HERE. We need your support! Or you can feel free to use any of the donate buttons on this page to do a one time donation of any amount. No amount is too small. Thank you in advance for any help you can give us. Mozzy, Bonita and Gracie say thank you! 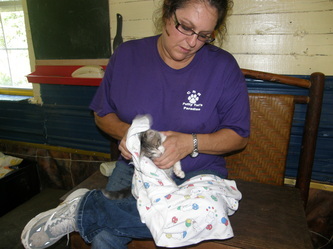 Charlie was the first kitten born on the cat ranch. 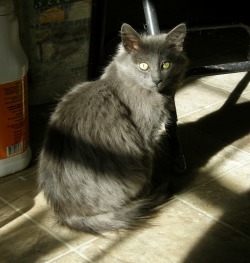 She came from a feral kitty (Purdy) that a friend of ours caught up. I had been trying to get them to get her spayed before she got pregnant again but they had waited too long and she looked pretty far along. We had taken in 2 of her kittens in the previous summer and both were farel. I worked with them and Beanie stayed in the house with us. 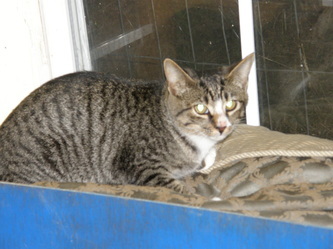 Stevie is outside and very feral. We had hoped he would tame up but after several months in isolation with another kitty we decided it wasw unfair to keep him locked up and let him out that spring. He loves the sanctuary but keeps away from us for the most part. 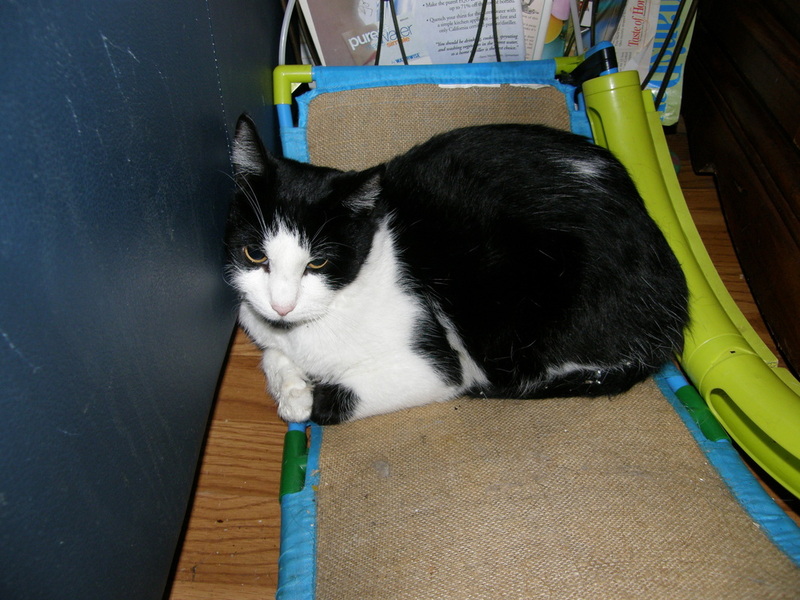 When the day came we got a call and were asked to take in the pregnant kitty we gladly accepted. We agreed to keep her until the babies were born and then get her spayed and return her but the kittens would stay with us. 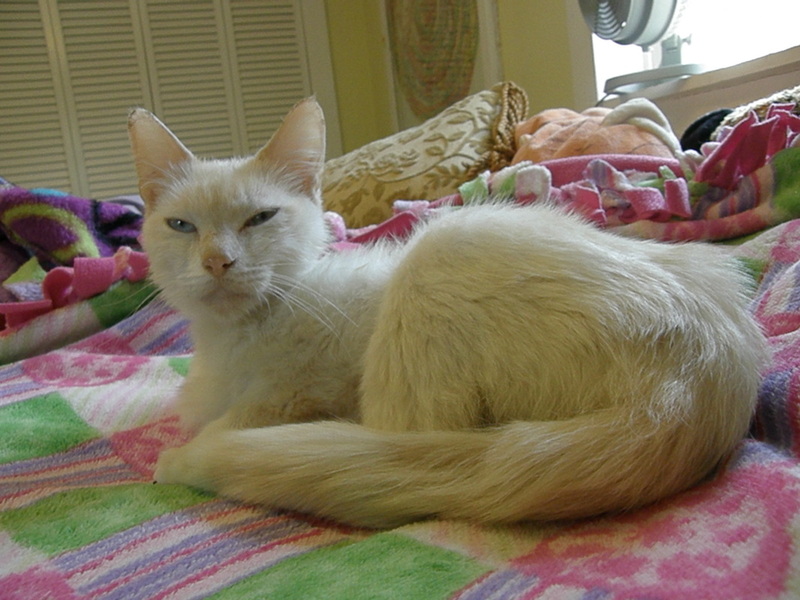 When she first arrived she was very shy but after a few weeks she calmed down and would grudgingly let us pet her. Then one morning I went out and she had delivered her kittens. One was dead already. It was a tiger stripe just like the other one who seemed fine. We named the baby Charlie because we really didn't know if it was a boy or girl and this way the name would be okay either way. The baby grew leaps and bounds and oh what a joy! We found out it was a girl so Charlie girl she was. She has suffered seveal bouts with viruses but is such a cutie, always jumping on our backs and on the way to the vet we discovered she was a natural truck riding kitty! We hope she will continue to be easy going and maybe can use her as our mascot, possibly taking her to classes for teaching and for children to enjoy. Time will tell but until then she is a very happy go lucky little girl. We finally talked the owner of Purdy (so we named her) and they agreed to let her stay with us too. She loves her little baby Charley very much and I hated to split them up. Now she is happy to finally get to be a kitten herself. Shes just a little over a year old and has spent most of her life trying to be a mom to her kittens. Now she can be free to be herself and has learned to play like a teenager. We love her very much! 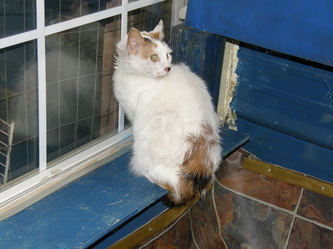 The Cat Ranch has rescued many cats from terrible fates. One such cat is Autumn. We received a call late one evening in June of 2009 from a very upset woman who had found a small kitten dumped out at the local dumpsters. She said it was starving so we rushed out with some food and a kennel to see if we could find her. 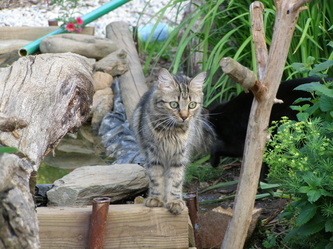 When we first arrived we thought it was gone but upon closer inspection we found a small gray, long haired kitten about 4 months old curled up in some leaves by the fence. She was frightened, cold and hungry. With some coaxing and a can of food ,she came close enough that I could catch her. If we had not found her with winter coming on and no food she would have died. We took her home and gave her the love and care she needed. We named her Autumn because that is when we found her. She is now spayed and growing into a beautiful girl. This is one of the reasons we do what we do. There is nothing more rewarding than to know you made a difference to just one. This one tiny beautiful girl will never have to worry about shelter or food again. Update: Autumn passed away this year (9-17-2010) after a fighting a losing battle with FIP. She will be missed.